Senator JV Ejercito is lauding the approval on third and final reading yesterday of Senate Bill No. 2923 also known as the Anti–Agricultural Smuggling Act of 2015, a bill which he authored that declares large-scale agricultural smuggling as economic sabotage. “Salamat say Senator Cynthia Villar at sa Komite ng Agrikultura. Para po itong panukalang batas sa ating mga magsasaka at sektor ng agrikultura!” (I am grateful for Senator Cynthia Villar and the Committee on Agriculture. This bill is for our farmers and the agricultural sector), Senator JV as Member of the Senate Agriculture Committee said. The senator is expectant that the measure will not only put an end to agricultural smuggling, which yearly cripples our economy by P200-Billion, but will also help the prevailing crisis in supply, production and price of agricultural products. 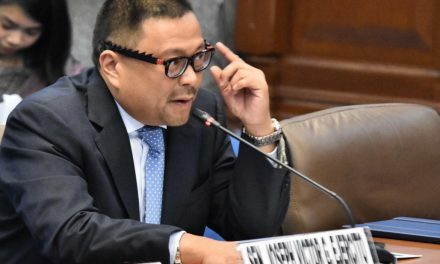 Ejercito noted that the Anti-Agricultural Smuggling Bill is a piece of landmark legislation since no one has been convicted for smuggling agricultural products.